It's 2017 and over the last 10 years the world of Search Engine Optimization (SEO) has changed considerably and Indigoextra with it. 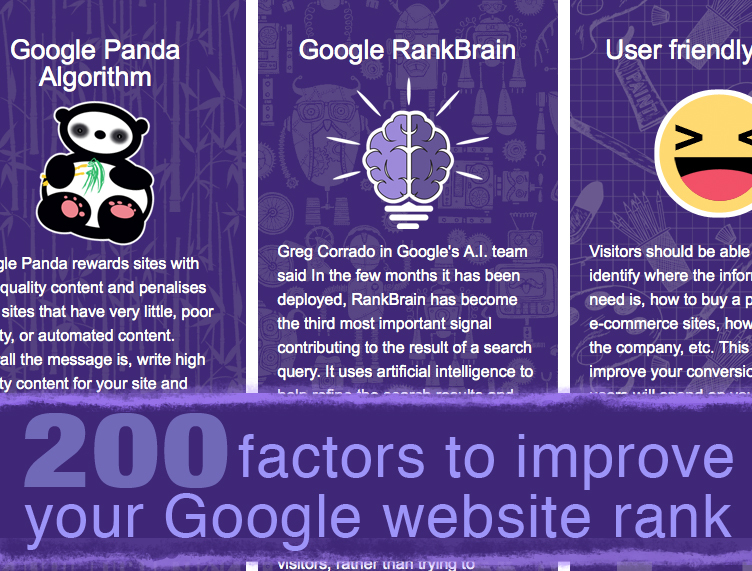 With the ever increasing importance of algorithms like Penguin and Panda and the more recent introduction of Artificial Intelligence to their algorithm in the form of Google RankBrain, SEO is changing every day and anything you read about SEO before 2014 needs to be re-examined. Some things you read from 2016 might also need to be re-examined! A few people have asked us for a definitive list of all 200 website ranking factors that Google take into account when deciding which website to put first in the search results and that's why we've put together the Interactive Infographic - 200 Essential things you need to know about SEO. There's a popular myth in the SEO world that Google uses 200 different SEO factors to rank websites. This originated back on the 10 May 2006 when they announced that "Google uses over 200 signals for ranking". Since then things will have certainly got more complicated and it's likely that RankBrain, their third most important algorithm can identify new ranking signals to use, as well as modifying the weighting of numerous other factors. Our interactive infographic is therefore more in the form of '200 essential things you need to know about SEO'. This includes some other common SEO myths that have been disproved and is ordered by category and priority, with the most important factors at the top of each category. Other people have tried to create lists of the 200 website ranking factors from Google's perspective, asking themselves "What can Google measure?" We've taken a different approach and asked "What do webmasters, SEO experts and company directors need to know?" For example, Google can precisely measure the Click Through Rate (CTR) to your site (What percentage of people who see your site in the search results clicks to visit it), but will find it harder to directly measure how well written your Metatag Title, Description and URL are and if your domain name carries any psychological weight, yet the latter factors determine the first factor. Another example would be the duration people spend on your site and how well designed it is. We've therefore listed both the factors Google can directly measure and the factors you can control that Google may not be able to measure directly, as well as listing some other factors like including 'Calls To Action' on your site, that will help you receive more enquiries or generate sales, the ultimate purpose of most SEO campaigns. Google's ranking system is not all about algorithms, they also employ people to manually review websites, therefore whatever makes it better for your end-user will also help your SEO. We've cited a source for many of these factors; sometimes this is exactly what it says - a source for where we got our information, particularly if our recommendation may seem controversial, other times it's a link to another page on Indigoextra, or to a third party site that takes you to more information on how to optimize your website. When categorizing each factor we deliberately only assigned them to one category each, choosing the one we felt was the most relevant. Simply click any category at the top of the infographic to view all the items within that category, or you can click to view All 200 SEO Factors. The SEO Infographic was written by Martin Woods, SEO Director of Indigoextra, with 17 years experience in SEO and web design and designed by Allison Carmichael, the Design Director of Indigoextra, with 30 years experience in graphic design and web design.